I’ve always wanted to turn Sheffield into the centre of the squash universe. And I get a chance to show off my sport in all its glory in the first ever Steel City Cup at the Abbeydale Sports Centre tomorrow night. We have organised the event, which gets underway at 7pm, to raise cash for Sheffield Children’s Hospital Charity. I’ve been a patron of the charity for a few years and it does amazing work. Former squash world champion Laura Massaro and I will lead two all-star teams. We have BBC Breakfast presenter Dan Walker taking on Sheffield Sharks skipper Mike Tuck on court and boxers Kid Galahad and Paul ‘Silky’ Jones will also be swapping their gloves for rackets. Malaysian No 1 Nafiizwan Adnan faces talented youngster Nick Wall Jr and James Biggin, MD of Steel City Marketing, who has been instrumental in setting up the event, locks horns with one of my Academy starlets Charlotte Jagger to complete a brilliant line-up. I’m so grateful to the people who have agreed to give up their valuable time to make the event possible. The level of support we have received has been incredible. So many people have wanted to get involved and I’m hoping to make it an annual event. It has not been easy trying to juggle everything when you are still trying to focus on playing and the family but I owe a lot to Steel City Marketing, who are hosting the event on our behalf. 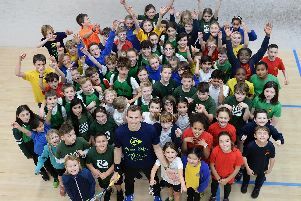 James Biggin is a big squash fan and he wanted to put something back into the charity and I couldn’t have done it without him. All proceeds will be going to charity and we want people to come down and have a good night in a relaxed, laid back environment. Hopefully they will be entertained and see some world class squash. There will be food and drink served and raffle prizes too. The Steel City was inspired by Dan Walker’s celebrity charity golf day the ‘Walker Cup (not that one)’, which I have been lucky enough to be a part of in the last couple of years. It is an amazing event and I wanted to do something similar in squash. Squash is played all around the world and it is nice to do something which is a bit of fun for a great cause. Hopefully we will get a packed house and it will be a great night.